Rana Overseas leading Manufacturer, Exporter and Supplier of Clay Tasha Drum. We have wide Range of Iron Clay Tasha Drum.We have various Size and various Designs and Shapes. Owing to the rich industrial experience and expertise in this business, we are involved in providing Musical Drum Set. 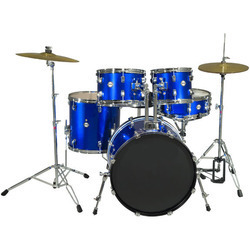 Assisted by a team of competent and qualified experts, we are offering a high quality Drum Set. Offered in different designs and configurations, our musical drum set is very popular among artists, musical bands and musicians across the world. We are one of the eminent manufactures and suppliers of high quality Drum Set, which comprise of two drums attached to each other. The smaller drum is known as macho and the bigger drum is known as hembra. Our shell of kongo-bongos are made from high quality wood and comes with one head on each drum. We offer Kongo-bongo at competitive rates. Drum sets / kits are an essential part of all bands. We, at J. Mondal & Co., offer our clients with drum kits of all major brands that are known for their superior quality sounds and tones. We also offer all types of accessories for these drum sets.